Shoot First, Mumble Later: Heritage hero or villain? This afternoon, BBC World broadcast an episode of Heritage Heroes applauding the work of Mohamed Turshi al Soghayer who was instrumental in conserving the traditional multi-storey houses of Rijal Alma in southern Saudi Arabia. The chairperson of the jury was Sultan bin Salman bin Abdul Aziz al Saud, head of the Saudi Supreme Commission for Tourism and Antiquities, whose statement can be read on the Heritage Heroes site here. 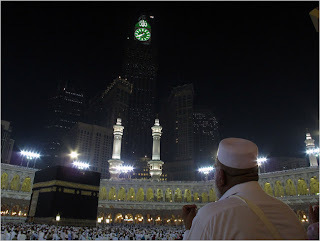 Earlier, I'd read a New York Times article about real estate development in Mecca, including the building of a huge clocktower modelled on Big Ben and a series of highrises right next to the Kaaba. The clocktower is six times the height of its Westminster model, over 1900 feet as against Big Ben's 315 feet. The apartment blocks and clocktower were built by bulldozing an old Ottoman fortress and levelling the hill on which it stood, to fulfill the demand among super-wealthy Muslims to have a room overlooking Islam's most holy site. Rapid construction around the Kaaba has displaced Meccans who've lived close to the site for generations, and created a divide between the rich who ring the complex and their less well-off brethren who have been forced further afield. According to many this runs contrary to the idea of Mecca as a place where class distinctions, so prominent elsewhere, fade, and are replaced by a sense of oneness and solidarity among all Muslims. Prince Sultan, head of the Heritage Heroes jury was asked about the kitsch version of Big Ben rising where a hill and fortress used to be. He replied curtly, “When I am in Mecca and go around the kaaba, I don’t look up.” So much for commitment to heritage. It was surprising in any case coming from a member of the clan of Al Saud, probably responsible for more destruction of built heritage down the generations than any other currently powerful family in the entire world. On a related note, today's Mumbai Mirror has the results of a poll listing the city's 'seven wonders'. It's a bit of hyperbole, but two predictable winners are VT / CST station and Haji Ali. Haji Ali was ruined years ago when a guesthouse was built right behind the dargah, warping the delicate outline of the structure seen against the sky. Now there's a proposal to dilute heritage norms for VT, and to use land on its eastern side to build, what else, shopping complexes and hotels. All of Bombay's municipal corporators ganged up not long ago to push through a scheme to redevelop Crawford market along similar lines. This morning's paper left me thinking: if the skyline around the Kaaba could be destroyed, what hope for a 19th century railway station and market? that last part about crawford market and VT has me quite worried. I mean these are landmarks that are beautiful inspite of the filth. Nothing a little cleaning up couldnt set right. I hope this doesnt really materialise. This is called bleeding heart sympathy! Not sure what the 'this' in your sentence refers to, Anonymous.